My friend’s aunt, Patricia (or Nana Patty to her grandkids) is the most vibrant woman I know. At the age of 67, she’s showing no signs of slowing down. She’s had her share of disasters that would probably break a weaker person. What’s amazing about Aunt Patty is how she’s never fazed by life’s challenges, and doesn’t have one jaded bone in her body. No one I know radiates the combination of grace, beauty and grit that she does. I’d say she’s on to something. I certainly took her advice to heart and I’ll be sure to do the same when I get to that age. In the meantime, there are a few other habits I came across that will help get me there. My older self will thank me for practicing them now. My chat with Aunt Patty got me onto researching the process of aging, and how to slow it down. What I found is that aging begins at a cellular level – particularly in your chromosomes. Nobel Prize winning biologist Elizabeth Blackburn explained in her TED talk that aging is accelerated by the lack of a certain enzyme in our DNA called telomerase. Telomerase protects our cells when they divide. It’s like of cap that covers the tips of the newly divided DNA strands as they split. When this key process slows down or stops working altogether, the end of those DNA strands called telomeres get shorter and shorter. And this is where it all starts to unravel, causing the human body to slow down and start the aging process. Is it any mystery that what goes in our bodies affects our health? It can’t be said enough, because nutrition is one of those things people take for granted. Until their poor food choices catches up to them, that is. Don’t wait until you reach the point of no return – invest in a proper diet and start extending your life today. Cut out or reduce the “bad” stuff (simple, I know). Eating healthy has a lot do with what DOESN’T go in your mouth.For instance, consuming too much sugar is very easy to do, but it has dire consequences on your long-term health. It raises your blood sugar levels, which leads to all sorts of life-shortening complications. It also accelerates skin aging through dehydration. Similar happens with salt, gluten, and processed foods. Water isn’t technically food, but it deserves mentioning because it’s a vital substance will serve you well. Your younger-looking skin will thank you for staying hydrated, not to mention your healthy digestive system and flexible joints. Coconut water and lemon water are also powerful options. Antioxidants are nature’s military defense. In this day and age, we’re more saturated with toxic substances, both in our food and the environment. 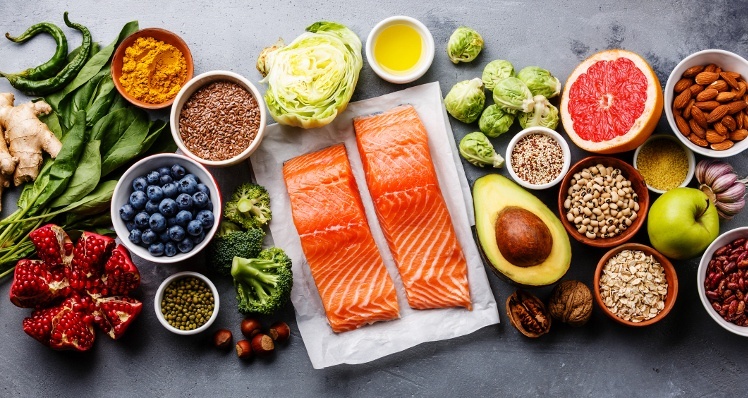 Throw in a fast-paced lifestyle that takes an additional toll on your body, and you’ve got a recipe for free-radicals that accelerate the aging process.Include antioxidant-rich foods like watermelon, grapes, blueberries, mushrooms, salmon, avocado and dark chocolate (yes, seriously) into your daily diet to enjoy their age-slowing benefits. Antioxidants that include vitamin A, C and E help to keep your cells from breaking down too early. Walnuts, chestnuts and pecans are great in preventing health problems and brain degeneration down the road. Also called nature’s broom, fibre will help you flush out those nasty toxins in your body. Whole grains and fruits, along with certain veggies are rich in fiber which will help your heart and digestive system. Live clean by eating greens: leafy greens like spinach and kale are also packed with antioxidants and give your immune system a serious boost. Exercise is another obvious one, but there’s no way around it if you intend to slow aging and enjoy life more. A study done by Brigham Young University showed that people with the habit of exercising regularly have longer telomeres than those who don’t work out. The results of thousands of participants indicated that even half an hour of exercise a few times a week can make a serious dent in the aging process. Give yourself more time to accomplish all those things you want in life, and put this on your to-do list for staying young. It’s not just your body that needs exercise. Your brain has to stay in shape too! One of the most effective ways to keep your mind sharp is expending your mental energy on creating solid, worthwhile goals. No matter your age, everyone needs to be engaged in some kind of meaningful pursuit to keep their mental health and general morale high. So revise your vision statement today! If you haven’t done this before, it’s basically a written declaration of what kind of person you want to be in the future, and the goals needed to make that happen. Remember, giving your mind something productive to chew on is the best kind of workout. This is similar to the last one in the sense that it keeps the gears in your heard turning. However, learning new things is a different kind of mental workout. As you acquire new knowledge and develop new skills, your brain undergoes a process called neuroplasticity. What happens is that your grey matter grows and your neural network gets an upgrade. In other words, this is another awesome way to fight the risk of dementia and age related conditions. This is the perfect excuse to get a new hobby or revisit and old one. Sign up for a class, learn a language, pick up an instrument, or get involved in your local community. The more you open your mind to new things, the better you can keep it firing on all cylinders. As the wise say, don’t buy things – buy experiences instead. This isn’t just for the social media selfies, it turns out that embracing the unfamiliar and uncomfortable is also great for your well-being. Like learning and having goals, travel strengthens brain function and slows ageing in many ways. And if you’re feeling bold enough, you can take up a new language to make things even more interesting. The truth is that you’ll never run out of things to complain about. If you wanted to. But would you really want to live this way? I’ve made it a personal rule to not complain (either internally or out loud) UNLESS it serves some constructive purpose. Other than that, I’d rather pay attention to the all the wonderful things in the world to be thankful for. For every bad thing you could whine about, there are ten things that make life awesome. Do yourself a favor and notice them! For people who are used to complaining instead of being grateful, this can be a challenge at first. But like a muscle, all you need is to keep using it to make it stronger. Take the first step by writing down a few things that went well in your day. With this practice, your brain will begin to re-wire itself – and reduce your daily stress in the process. Trust me, gratitude is like a drug that makes you happier and younger. When you unplug your mind, it’s like the world changes around you. We all have a lot on our plate, and it’s increasingly easy to lose perspective or get caught up in thought trains. By practicing mindfulness we can release stress, relax, get a greater perspective, unleash hidden creativity, and cultivate a life that is simply more enjoyable. … Not to mention the fact that many studies have shown mindfulness to provide incredible benefits for our mental well being and to even improve our physical health and immunity. One of the biggest effects is reducing stress hormones, which actually helps us to stay young. Reducing stress hormones will in turn ease the strain on your cells… Giving every cell in your body better leverage in the battle against aging.